My name is Nick. 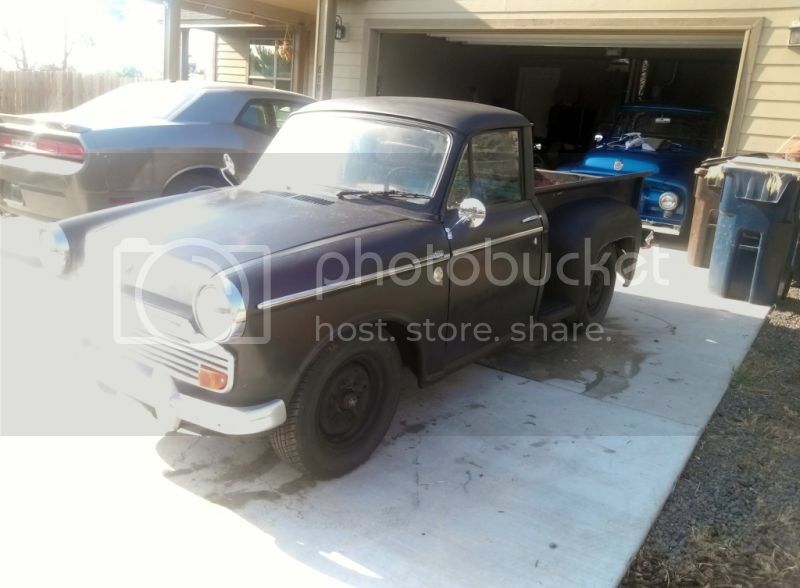 I've been on the forum for a little while now looking to find the right Datsun, and learning what I could while searching. I had attempts to buy 2 different 510 sedans not pan out. Then last month I saw this 320 for sale by chris67 here on ratsun and really liked it. 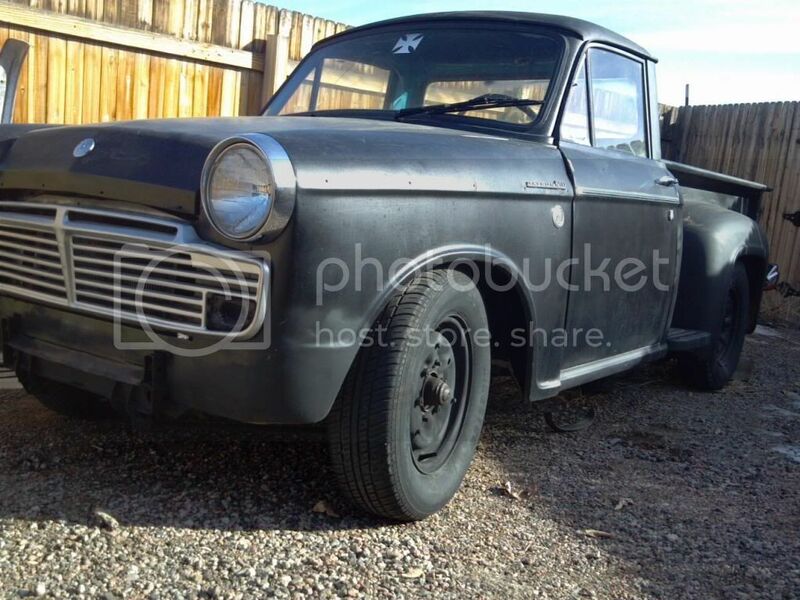 It ended up working out and now I am the new owner of a 1964 Datsun L320. The money has been transferred and I should be shipping it to Colorado (to my dads house) towards the end of this month. It will be a slower build since I am in California and the truck will be in Colorado, but that is where the tools and garage are. 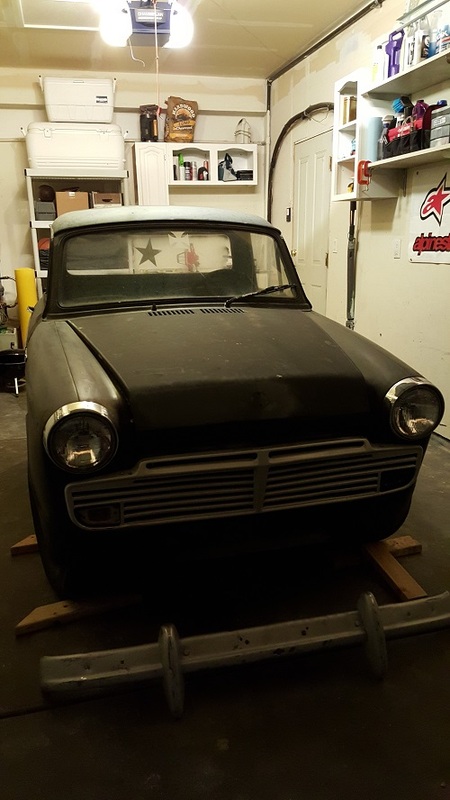 Once I get the project kick started I will start a build thread, but for now just thought I would say hi. I only have the pictures that were attached to the for sale posting. Ill post more when I can take them. Welcome to the 320 clan, can't remember if this one ran, but the last non-running truck I bought from Chris actually did run, he just never tried to start it. Glad you commented Wayno. I've learned a lot about these trucks from your posts. I don't think it runs as is, but won't take much to get it going. I think the listing said the carb needs installed and the brakes need bled. 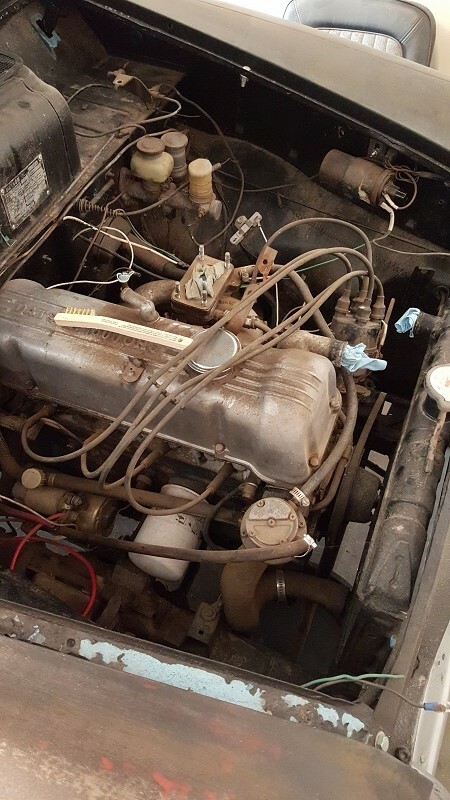 I have an extra carb and intake manifold from a buddy who is swapping the L16 on his wagon. Luckily I am only around 5'10" so it shouldn't be too uncomfortable for me in the cab. Quick update on the new Datsun. 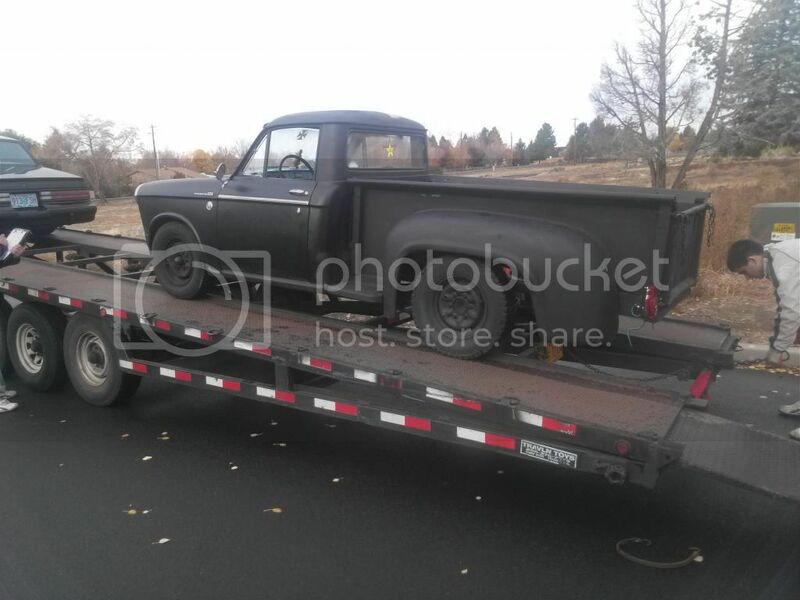 The driver picked the truck up yesterday and it is now on its way to Colorado. Chris sent me this picture after they got it loaded up. I'll be visiting my parents (and my new truck) in December and should start my build thread then. I saw this on craigslist! Here are a few pictures of the pickup I took over the holidays. I didn't get a lot of work done, it was my first time seeing it in person. I mostly cleaned things up and started sanding some of the floorboards. Now I have a better idea of what needs to be done. I am going to start with some welding to add mounts for the bed. It was not attached. 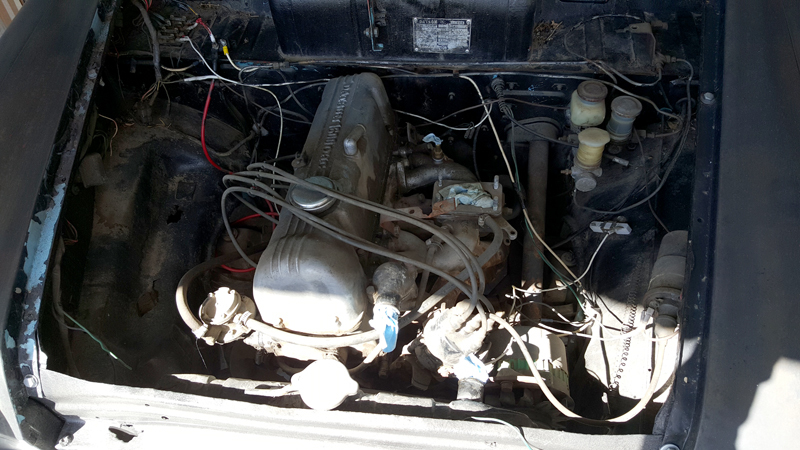 Once the bed box is in place I need to mount and plumb the gas tank so I can start the work to get it running. It's going to take a lot of work, but that's what I expected. That's the fun in owning an older car. The second picture didn't turn out too well. I took it the morning before I drove back to CA and the sun was directly behind me. 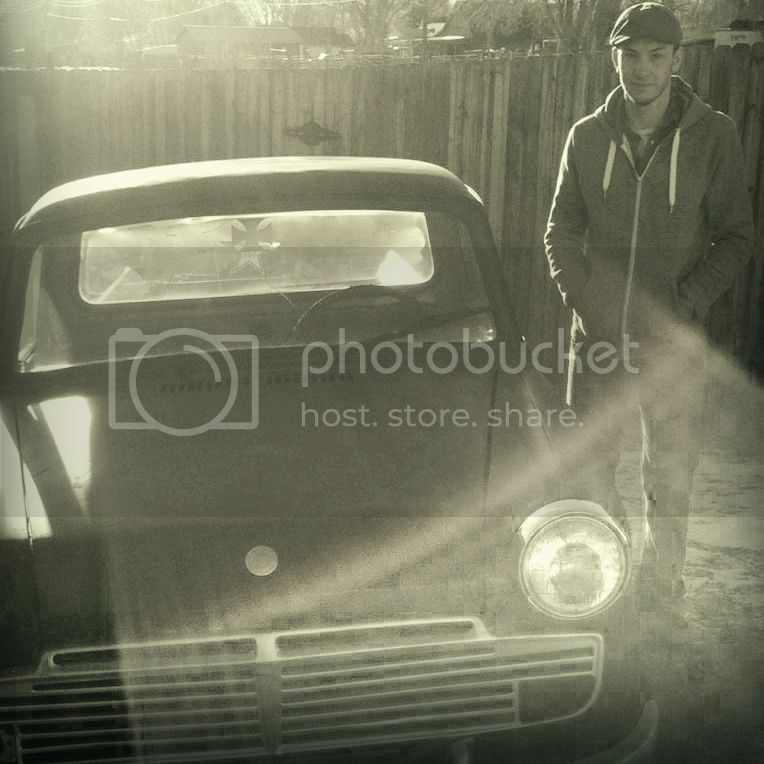 I just thought I'd include a picture of me with the truck. 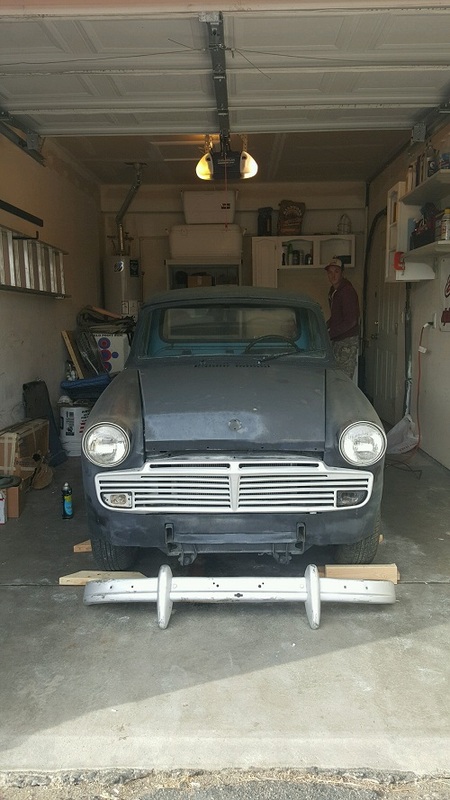 After a few years of the 320 sitting at my parents house I am finally getting started on this project. I live 120 miles away, so I haven't been able to do much with it. This summer I bough a place in Denver, so now I have a garage to work in. I rented a Uhaul tow dolly this weekend and towed it home. The step side bed didn't survive the initial trip from Oregon to Colorado. It wasn't bolted to the frame, and a lot of the welds broke. I removed it and took the bed panels apart. I will fit it and re weld it later. I didn't want to risk it falling off again during this trip. Later that night I got the truck unloaded and pushed it into its new home. I noticed that the hood emblem fell off during the trip. I was bummed out, but at least that is the only trouble I had towing it home. The next day I cleaned the old stickers and overspray off of the glass, and knocked down some of the surface rust that was starting to develop where the rattle can black did not hold up to being outside for so long. Then it was time for the first real project. The wiring harness is fried. I have been drawing up a new wiring harness. It is mostly complete. When I am finished I will post it here. 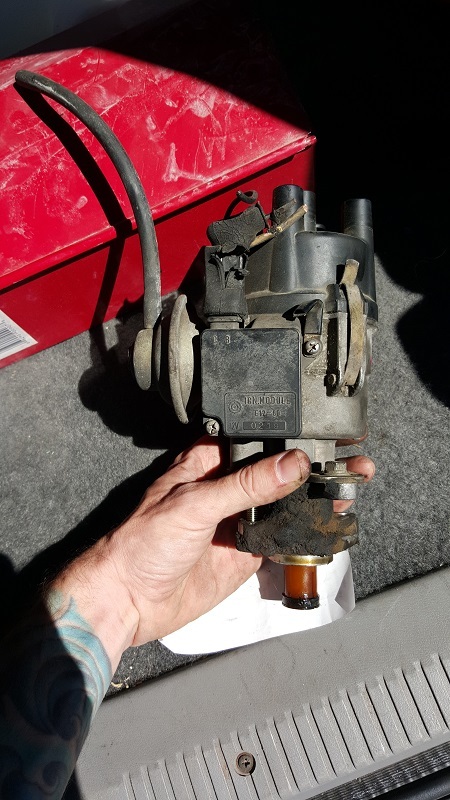 I would like to get feedback on the electronic ignition, and make sure I have it drawn up correctly after my research. I ordered some new wire on ebay, and am cleaning up the old connections while I wait for the supplies to get here. 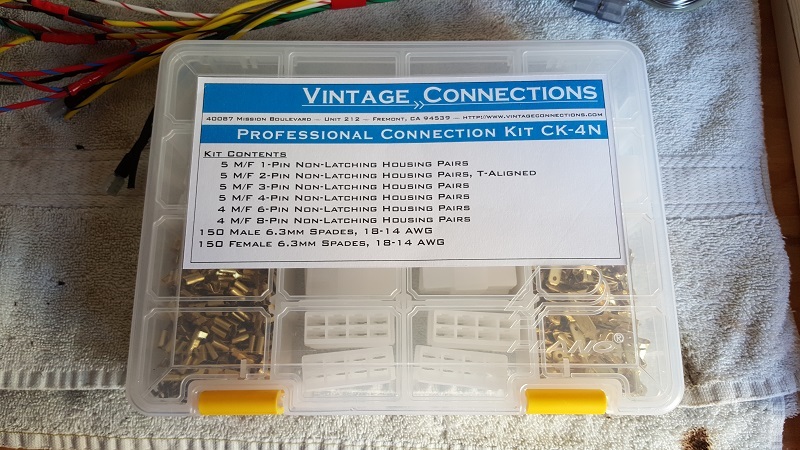 You can source all the Japanese connectors from Vintage Connections. Here is the wiring diagram. I will keep it updated as I continue to sort it out. 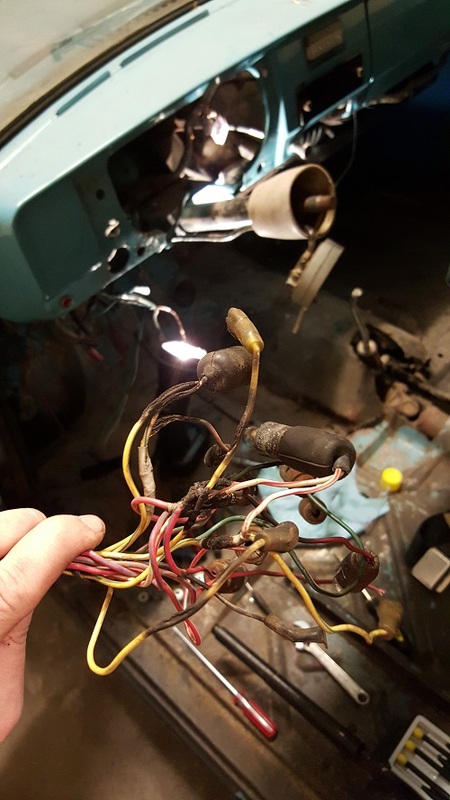 I also started a post in electrical to get help on whatever might be wrong. I got some of the new wires for the harness today, and started soldering. I will be busy for a while. I have a question on the wiring diagram. On the alternator T-Connection, isn't the vertical terminal (in the schematic) the 'L' terminal that goes to the 'idiot light' in the instrument cluster? Looks like you've diagramed them out in reverse of what I have. I'm in the middle of updating the loom in our 320 to accommodate a number of changes; electronic distributor, starter mounted solenoid, alternator, and stop-light switch on the brake pedal arm. 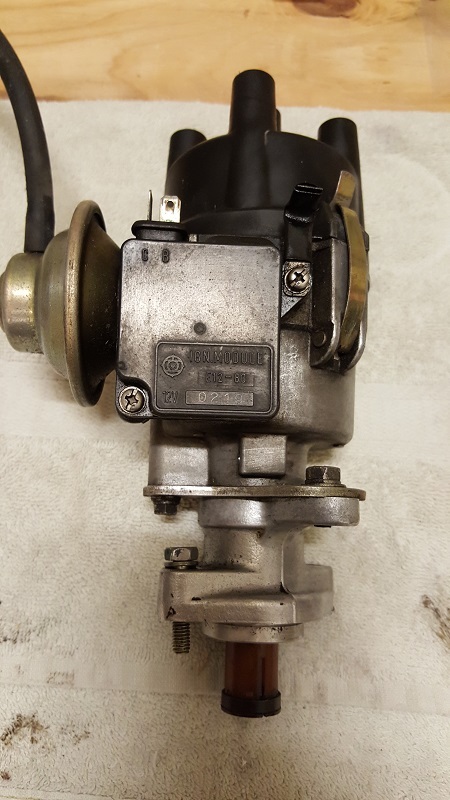 I'm using the same distributor with GM module and the same alternator as yours. What transmission do you have in there? 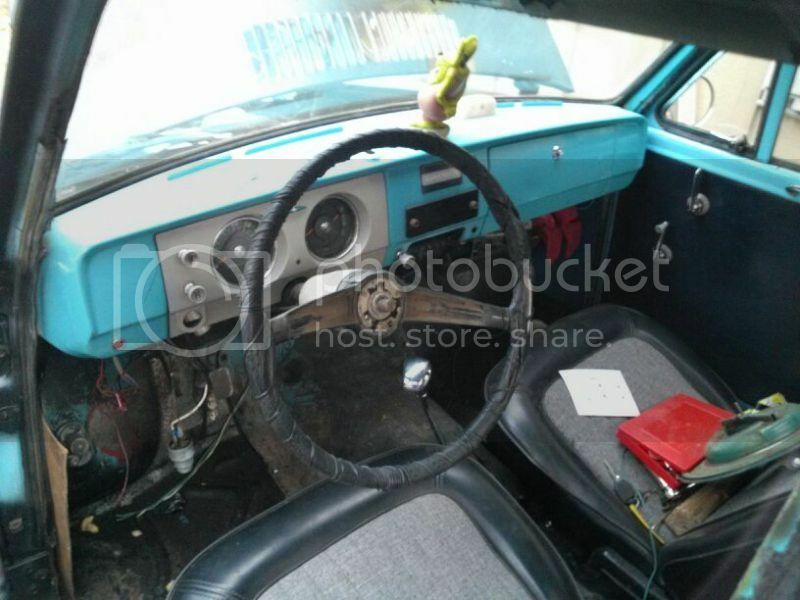 If you have the L-Series trany, I'd like to see a photo of the floor where the shifter comes up through. If you haven't taken a look at my build, check it out when you get a chance. It's the 'Mighty Mouse' thread a couple down from yours in the 320 forum. I just looked back and now see the floor cut for the later transmission in the instrument cluster loom photo. Thanks. you are probably right. I put this diagram together from a lot of different resources and am probably the one that has it wrong if ours are different. 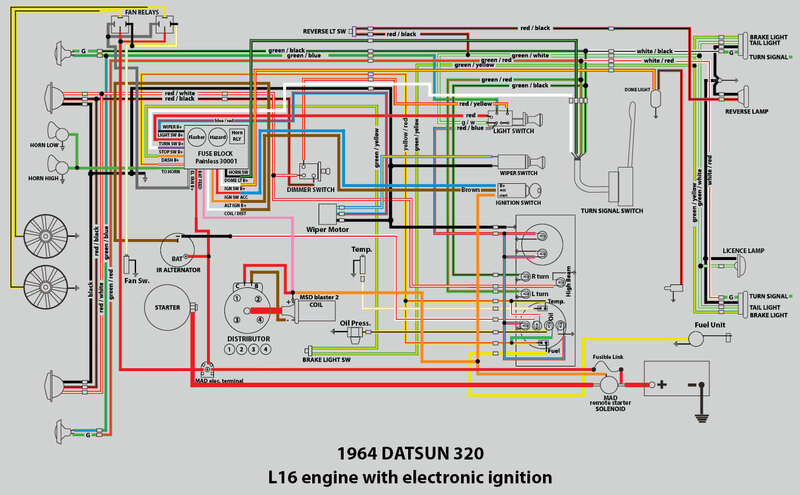 Nothing is really connected in my engine bay and most wires are burned under the dash, so I don't have a lot to go off of other than diagrams and info on the internet. The alternator was one of the main areas I was hoping to hear from someone on because the only label I see is the Bat post on the back. I wasn't sure which terminal was which for the other two wires.Thanks for noticing it! I will check your build thread. 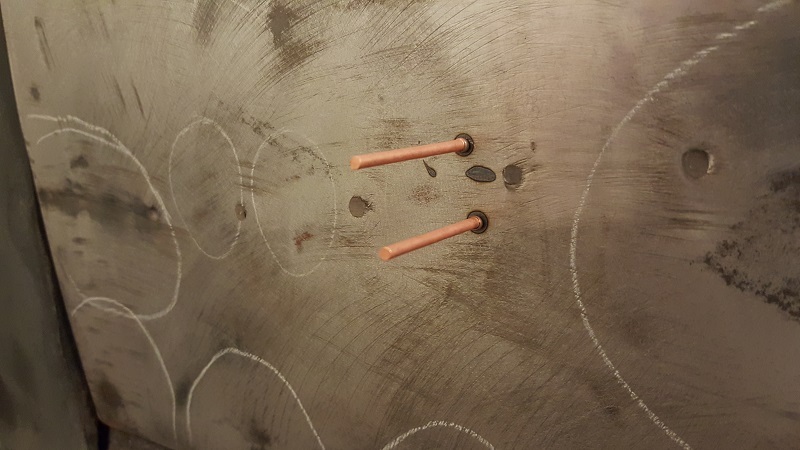 Also, if you want a better pic of the hole in the floor for the trans. I can get you one tonight. You are right on the white/red wire going to the idiot light. If you look on the back of the alternator, there should be an 'L' by the main stem of the 'T' socket. This goes to the light. The top bar of the 'T' has an 'S' which stands for 'Sense' and is what triggers the IR to charge. The 'S' wire should go to a wire that is hot when the ignition switch is in run position. I plan to connect to one of the front terminals on the fuse box on the inside side (upstream of the fuses). If you doctor the schematic up, please repost it. I'd like to grab a copy for my shop manual. You have the electronic distributor correct in the schematic. I'm using the same dizy as you with the GM module and the same alternator. I enjoy your thread. Thanks again Steve. I will keep updating the diagram as I go. I have it sourced on my hosting server, so as I make updates the image in the original post should change. Ill comment when I add any new changes to it. 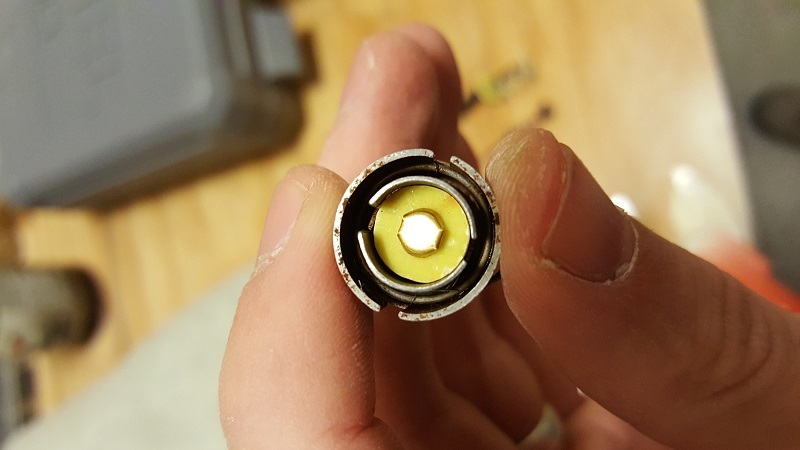 I ordered a set of connectors from vintageconnections (thanks Charlie69) I decided to just wire new connections instead of splicing into the old ones. I was running a few wires and removing the old harness while I waited when I noticed I do not have a fan. 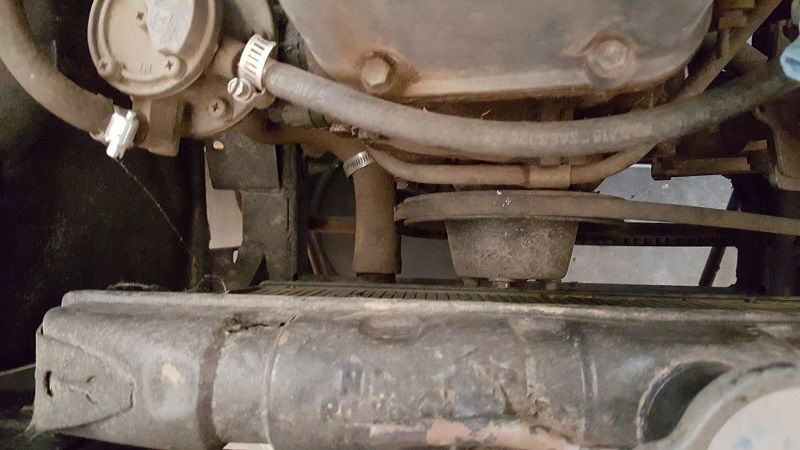 There is maybe a half inch between the water pump pulley and the radiator. I am going to have to run 2 electric push fans and hope that keeps it cool enough. I updated the wiring harness. I added the fans, and updated the fuse block connections. 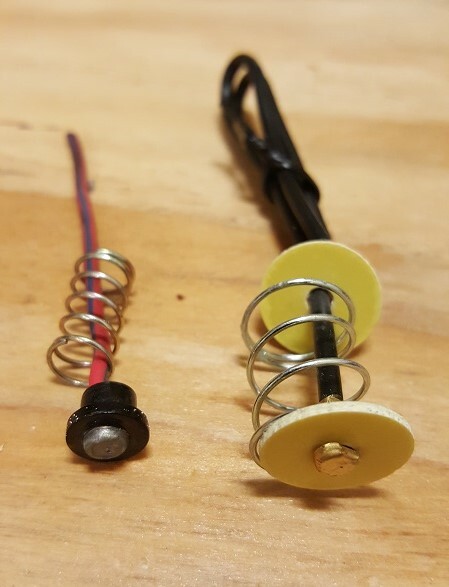 When i was reading the painless info I saw that there is a horn relay in the fuse block, so I took the factory horn relay out of the diagram. 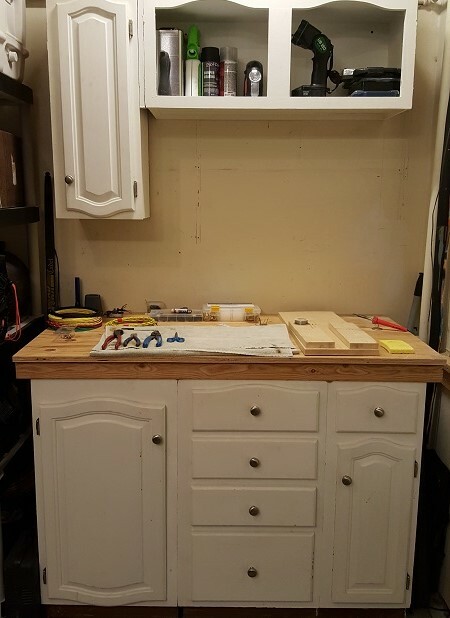 Over the weekend I spent most of my time installing a shop light, light switch, and outlet next to a workbench I made out of my brothers old kitchen cabinets. Once that was done, I got back to work on the harness. I got a few packages in the mail. 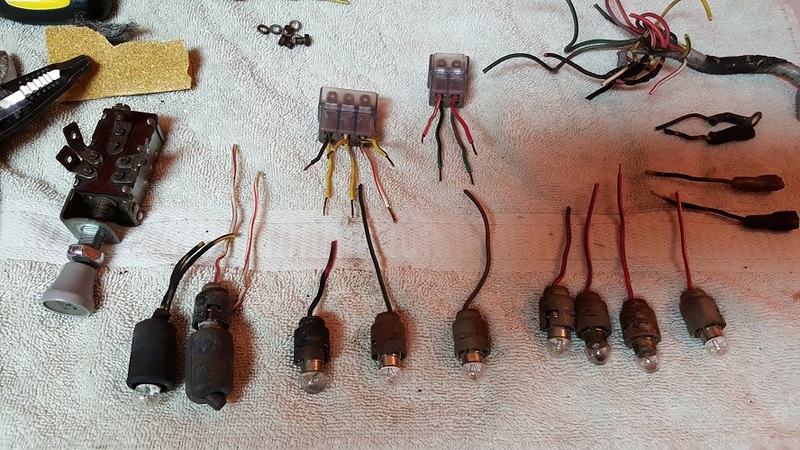 One was the kit from vintage connections, the other was a few single wire light bulb pigtails from summit racing to replace the burned out wires for the gauges. The pigtails weren't the right size, and I couldn't find anything at the local part stores. 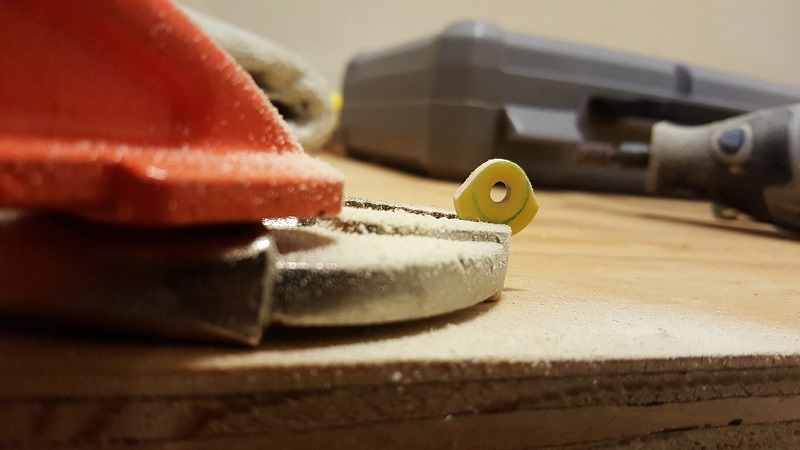 I decided it would be easier to just dremel them down than to keep looking for a part that fit. 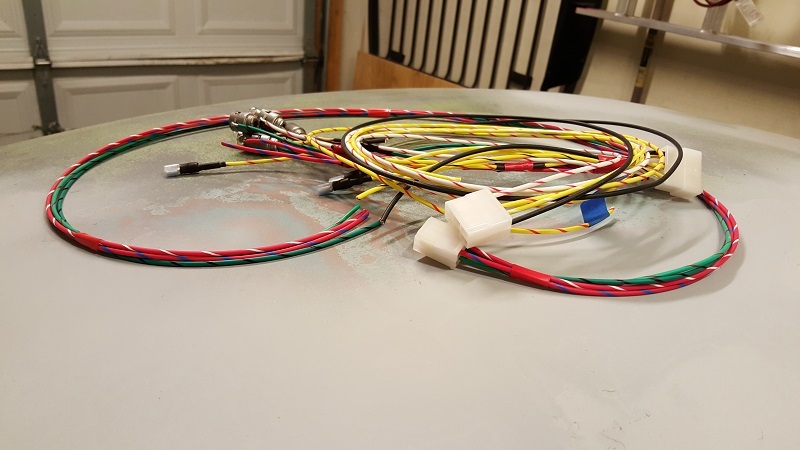 I have most of the under dash harness wired now. I need to connect the switches to the main loom, then I will move to the harness in the engine bay. Quite the craftsman. Keep sluggin'. Thank's Steve. I'm still chipping away at it. Nothing too exciting to post at the moment. I just saw the video of your engine running. It sounds great! I've made some progress this week. I haven't posted any of it yet because I have been busy. Earlier this week I caught two kids trying to steal my jeep. They had already broken a window and done a lot of damage around the ignition switch before I ran out to catch them. Anyway, I've been dealing with fixing that mess this week. 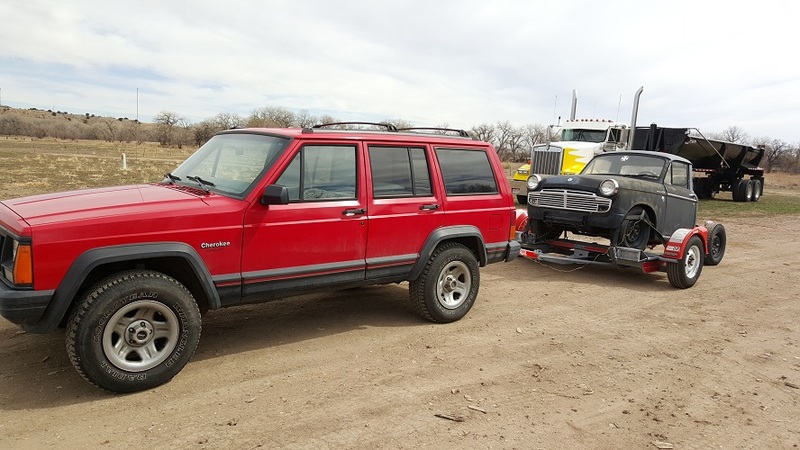 The silver lining to that story, is that I had to make a trip to the pull yard to get some parts for my jeep. While I was there I found an L20B that still had the matchbox distributor. It cheered me up during a rough day! It cleaned up pretty well. I have been doing some body work on the 320. I am still wiring the harness, and have most of it done. I would like to spray the engine bay before I install the harness though, so getting the cab ready for paint is next on my list. I'll pull the engine and prep the bay once the rest of the body is straight. I started on the driver door. It had the most noticeable damage. I could tell it had too much body filler, because I could see a few hairline cracks in it. 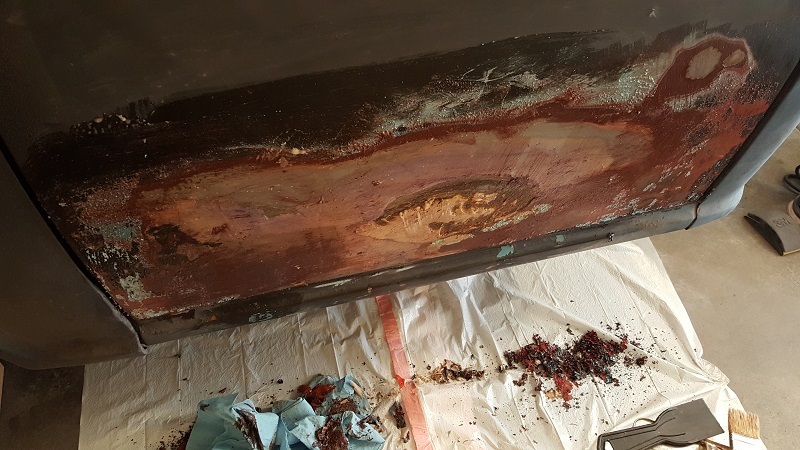 I used paint stripper to get a better look at where there was filler that needed to be removed. The stripper softened up the filler OK, but not as well as I had hoped. It was only enough to take of a small layer. 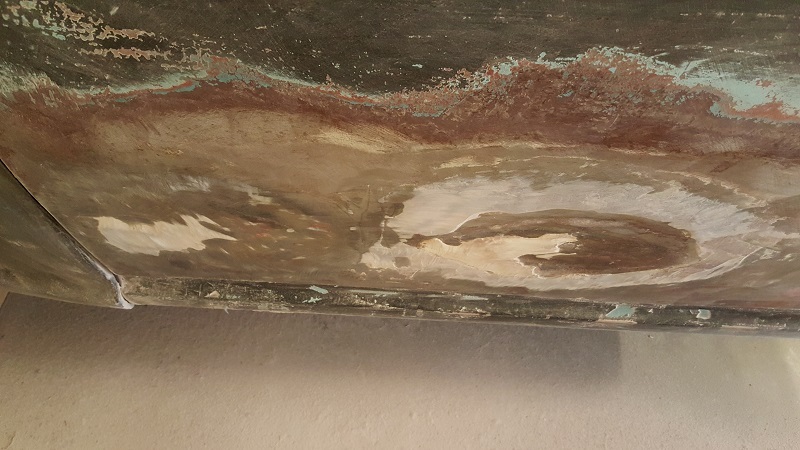 Underneath was still hardened filler. 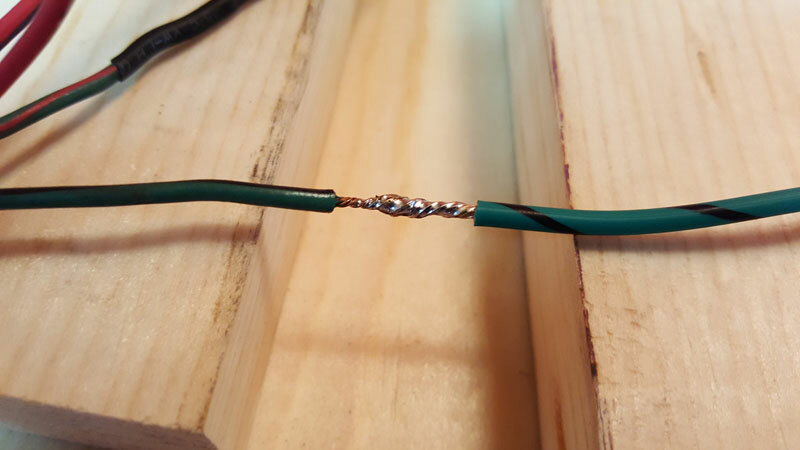 I used a combination of my angle grinder and a drill with a wire wheel to remove the rest. It was on there pretty thick. 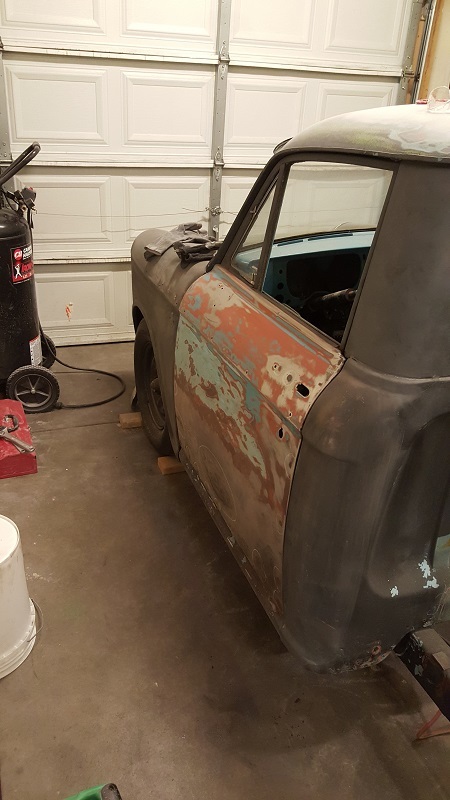 After that I sanded the bare metal a bit, and started pulling dents. 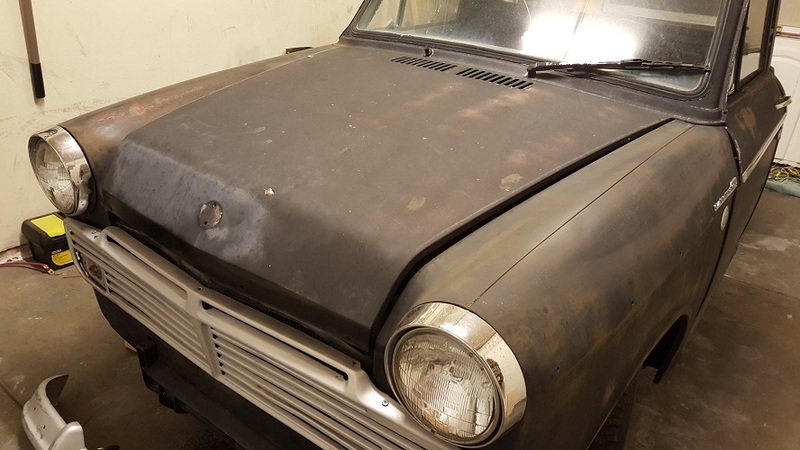 It is slow going because I have very little experience with bodywork, but it is fun, and gives me a lot to do without having to spend more money on the project for now. 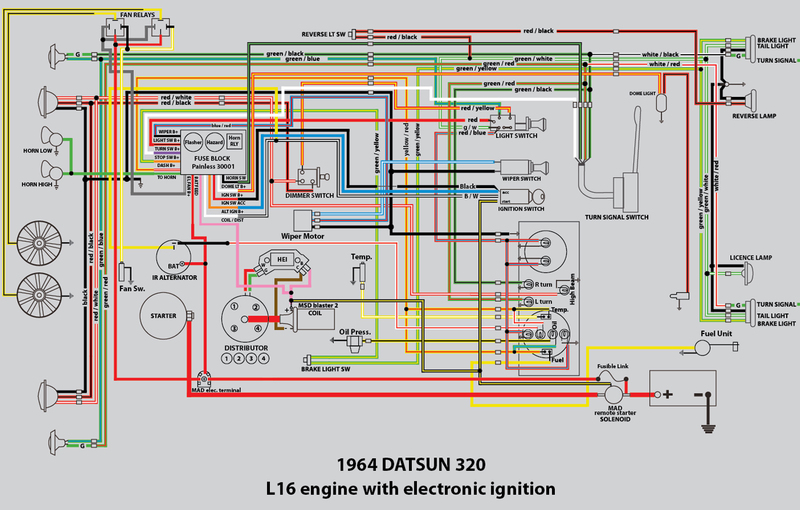 I updated my wiring diagram now that I found a matchbox distributor. 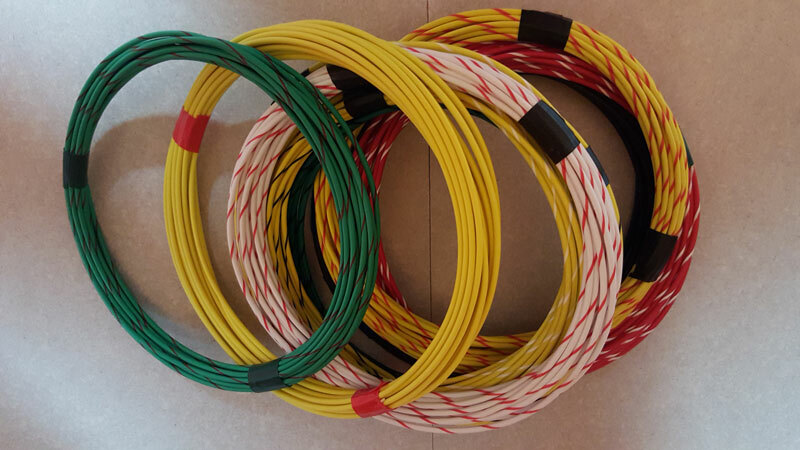 I also changed a few of the wire colors to colors that I could order. I am pretty sure the only non factory colors are the blue/yellow to the wiper motor, the brown for ignition/alternator to the fuse block, and the orange ignition start. I will leave the first one as is just in case anyone wanted to reference it with the HEI and original wire colors.